Merkel with Trump at the G-7 summit in Charlevoix, Quebec, Canada. Trump's tariffs on steel and aluminum tariffs sparked tension at the meeting. BERLIN -- Chancellor Angela Merkel's government vowed to stand up for the German auto industry, sending a veiled signal to U.S. President Donald Trump to back off threats to levy tariffs on imported cars and auto parts. "The German auto industry is the core of the economy, therefore we have an interest that it has a strong position on the world's markets," Economy Minister Peter Altmaier said Tuesday in a speech to lawmakers in Berlin. "This isn't lobbying. This is national interest." Trump cited national security in imposing tariffs on steel and aluminum tariffs, a move that sparked tension at last week's summit of Group of Seven leaders. The U.S. president has threatened to extend his America First policies to the auto industry, which would hit Volkswagen Group, Daimler and BMW particularly hard. The trade dispute is part of broader tensions between the U.S. and Germany. 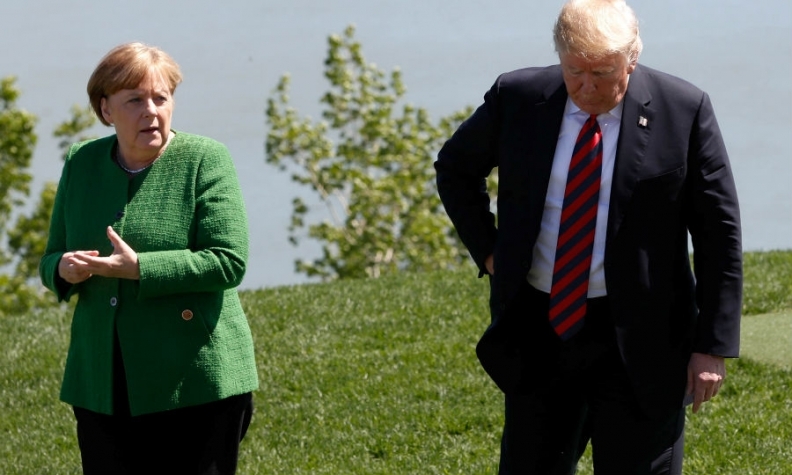 Bickering over anemic German spending on defense as well as the U.S. withdrawal from the Paris global climate treaty and the Iran nuclear accord has led Merkel to conclude the alliance between the two countries is no longer reliable. Altmaier indicated that he expects little improvement in relations as long as Trump is in power. "Shared values are stronger than any single politician who's in office for a few years," said Altmaier, adding that he was not going to start "bashing" foreign officials or utter a "bad word" about trans-Atlantic cooperation.